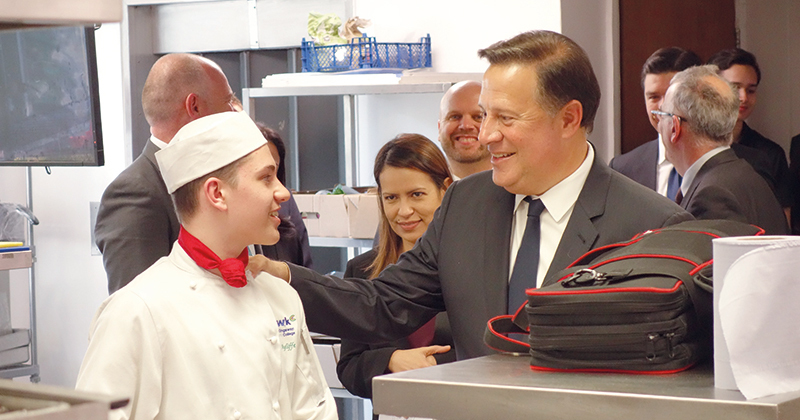 Last week, the president of Panama paid a visit to Westminster Kingsway College to learn more about technical education, accompanied by ministers and business leaders, reports Samantha King. The college, which is a member of the Capital City College Group, is part of a consortium working with the Panamanian government and the UK’s Department for International Trade to help set up and provide curriculum advice for a new vocational institute in Panama City, called the Instituto Técnico Superior Especializado (ITSE). The new facility, which is currently under construction, will help boost the skills of Panamanians in engineering, technology, business, hospitality and tourism, and Westminster Kingsway is leading on curriculum development in culinary arts and hotel operations. It is the only FE college involved in the consortium. 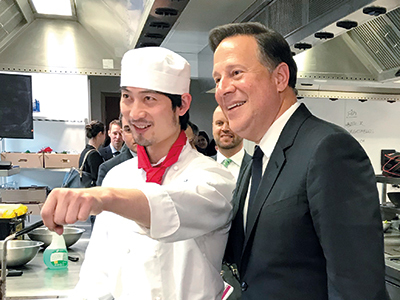 During his visit, president Juan Carlos Varela and his delegation had a tour of the college’s kitchen facilities, speaking with staff and students about their experiences. The president later tweeted that what he witnessed at the college was “an example of what we seek to achieve in our country”, in particular its “model of theoretical-practical training”. “The students learn in a realistic teaching kitchen and create dishes for public restaurants which we run. They’re learning in, essentially, a commercial kitchen environment and it was that side of things that was particularly interesting to the president,” explained Neil Cox, the communications manager for Capital City College Group. Alumni from the college’s catering courses include a host of celebrity chefs, including Jamie Oliver, Ainsley Harriott, Sophie Wright and Antony Worrall Thompson.